What is going to make the headlines in radiology and diagnostic imaging in the next five years? Dimitris Moulavasilis: Well, as an industry observer, I’m confident that the technology will keep developing at a phenomenal rate, offering improved structural imaging techniques, machine driven radiogenomic analytics and predictive biomarkers based on novel molecular imaging. Information technology will also play a critical role in radiology’s future. It will first enable an enhanced interconnectivity between modalities, radiologists, referring physicians and patients. All produced medical images will be stored in a cloud and this will fundamentally change current workflows. So in the future we expect to see an accelerated separation between image acquisition and image interpretation, the latter conducted from radiologists’ professional tablets anywhere in the world. Radiologists will then use the same medium to collaborate with referring physicians in real time over medical images and communicate with patients. This in turn will amplify the need for commonly accepted standards and protocols, so we expect to see a great evolution in this direction. Information from stored images will amount to big data, which will facilitate significant advances in deep learning and artificial intelligence, where advanced algorithms will help radiologists in their diagnosis and will enhance their productivity. How can providers like Affidea stay ahead in such a demanding industry? DM: First of all, we have more than 20 years’ experience in diagnostic imaging and a vast network of 170 diagnostic and cancer care centres across Europe, which we have been managing and growing all this time. Over the years we have been able to develop significant insight into what is important in becoming a provider of choice for all stakeholders, starting from the patient, the referring physician and the payer, be it public or private. This has to do with the ability to provide a proven, standardized medical outcome in an efficient manner and create a unique patient experience. To achieve this goal, we have been investing vastly both in medical and information technology; we are staffed with the best radiologists and medical professionals together with whom we have built a patient-centric, quality oriented culture. On the medical technology side, we have a very modern fleet, with over 900 imaging modalities, which rank better than the most demanding COCIR (European Coordination Committee of the Radiological, Electromedical and Healthcare IT Industry) benchmarks, while on the information technology side, we have put in place one of the most advanced IT infrastructures in the industry. These days, our patients can book their exams online and have full access to their results via a link to our secure cloud, which is sent to them through a simple email. On the quality side, we have pioneered several initiatives, such as our Dose Excellence Campaign to monitor and optimise the levels of ionising radiation dose that our patients are exposed to through CT scans. This represents a whole new way of thinking in diagnostics, putting patient safety at the heart of what we do, without ever compromising on image quality, just shifting the focus to the patient. Similarly, we look at the industry and we evaluate areas for improvement, such as the speed and efficiency of healthcare services, as well as a commitment to consistent quality, which can only be achieved through effective management. Our lean management techniques are designed to improve efficiency and patient experience by examining the whole process of booking, registration, scanning and results delivery from a patient’s perspective. This also saves costs, which is not so much the goal, more of an added benefit. We are six years into our lean management programme. Last but not least, our excellent centre staff are supported by renowned experts from the European radiology industry, who are members of our Medical Advisory Board. You talked about interconnectivity and advances in information technology. How are those advances affecting patient services today? DM: Online booking, for instance. Up to 20% of appointments in Ireland are now made online; this could become something like e-check-in for flights in the near future. It requires a robust booking engine, a patient-friendly booking process and an extremely well-connected IT structure to keep the slots fully up to date, manage patient data efficiently and make this paper-light process truly effective. The next phenomenon is remote radiology services. Using our cloud, a patient in Evora, Portugal, can have their images interpreted by a radiologist in Lisbon or (if local regulations allow) anywhere in our network of 170 centres. We can thus solve the serious problem of radiologist shortages, which is drastic in some of our areas. Of course, uniform protocols are needed here, and in some cases, we are pioneering voice recognition technology in different European languages to accelerate our radiologists’ productivity across Europe. The possibilities are endless, but they must be tailored to maximise their impact in our specific organizational structure. You have invested in a wide-reaching hospitality project in your organisation. Why is hospitality important in the healthcare sector? DM: I think hospitality is extremely important. Our overriding philosophy, one of the pillars of Affidea, is empathy. You cannot provide a good service for your customers without empathising with them and this is even truer in healthcare than anywhere else. Patients come to us with health issues, they are potentially ill, worried, and they need answers, but they also need reassurance that they will receive the best care and the professional attention that their particular case requires. This is where, not only our medical staff, but everyone who comes into contact with the patient, can play a key role, which is why we want to engage all centre staff in this initiative. Another very important aspect is to provide staff with the support and training they need to be able to go that extra mile and be that bit more caring and considerate. So staff needs are also a big part of this ambitious project. What is the industry’s biggest challenge today in Europe? I think that the industry’s biggest challenge comes from the economic context. On one hand, you have healthcare payers with limited funds, as a result of the recent economic crash and the anaemic growth in most regions. On the other, you have a growing demand for healthcare services due to population aging, growing diseases like cancer, cost of innovative treatments, and patient demand for increased access to better healthcare services. In this context, diagnostic imaging is coming top of the list during cost reviews, and consequently we see, year after year, significant tariff regressions and new frameworks aimed at containing costs. Another challenge is the scarcity of radiologists contrasted with the parallel, ongoing increase in both the quality and number of medical images produced by new technology scanners. What message would you give to the European radiologists attending this year’s ECR for the future of radiology? I would tell them that radiology is an exciting specialty and it is going to lead medical advances for years to come. Source & Image Credit: Affidea. Has Affidea Polska Found the Recipe for life? 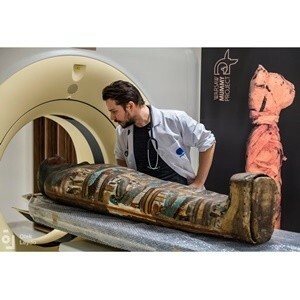 Warsaw Mummy Project- Did Cancer Exist in the Ancient World?